Union Defence Minister Nirmala Sitharaman said modernisation of Indian Army was under way. She credited Prime Minister Narendra Modi with the modernisation programme. The Defence Minister was here on Sunday to honour students of the state, who have been selected in Indian Military Academy and National Defence Academy in the recent years. “When you join the forces after competition of training at your respective academies, you will be proud to join a modernised Indian Army”, Sitharaman said addressing the gathering of successful students. She also asserted that the Army was fully prepared to deal with any situation. The minister recalled her visit to the Uttarakhand region during childhood days, pointing that the region was then known for Char Dham yatra. 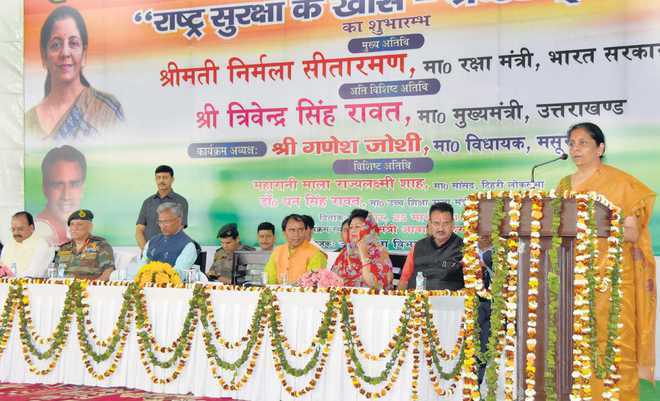 “But today Uttarakhand is also known as Veer Bhumi as a large number of youth from the state join defence forces these days”, she said. The minister also praised Col Ajay Kothiyal, Director, National Institute of Mountaineering, Uttarkashi, for his efforts towards motivating the state youth to join the armed forces. Nirmala Sitharaman also handed over a cheque of Rs 50,000 each to the successful student of Uttarakhand, who have been selected in Indian Military Academy and National Defence Academy from 2014 to 2018. A total of 140 selected students were felicitated by the minister. She also honoured family members of Victoria Cross awardee Late Gabbar Singh Negi, Veer Chandra Singh Garhwali and other defence forces martyrs.Chief Minister Trivendra Singh Rawat said it was a matter of honour that Prime Minister had reposed faith in a daughter of the country by making Nirmala Sitharaman as defence minister of the country.Chief of Army Staff Gen Bipin Rawat, Uttarakhand Higher Education Minister Dhan Singh Rawat and Mussoorie BJP MLA Ganesh Joshi were among the prominent persons present on the occasion.